Pepsico is an American multinational food, snack, and beverage corporation with its Indian based Headquarters in Gurgaon, Haryana. Pepsico entered the Indian market in 1989 and has grown on to become one of the largest food and beverage businesses in India. PepsiCo India offers its consumers a wide-ranging portfolio of enjoyable and wholesome products. The F&B giants were solidly conscious of their initiatives to protect the environment. They were in search of a service provider who could simplify effective energy-efficient solutions to their plant in Paithan, Aurangabad, Maharashtra. Their only insistence was that the solution should be energy efficient and environment-friendly. Rittal is the pioneer in delivering energy efficient climate control solution for the enclosures with its innovative and technologically advanced products and services. We were confident that Rittal solution for Pepsico would greatly benefit their requirement and strengthen our legacy. So, we approached Pepsico to conduct a health check-up and detailed audit of their enclosure climate control installed in one of their existing plants at Paithan (Aurangabad). Our engineers conducted the audit and suggested them for the right climate control solutions to be installed. Based on the audit we had to demonstrate as to why our climate control solutions was the best fit for Pepsico. 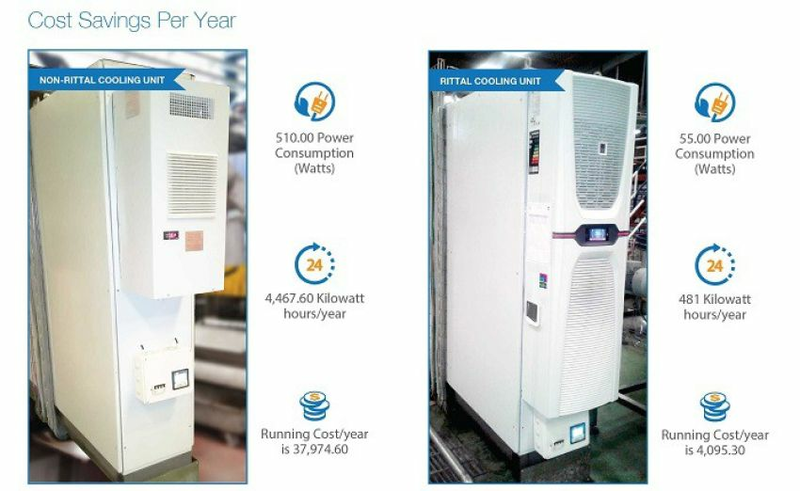 Rittal India in cooperation with Pepsico India decided to conduct POC (Proof of Concept) of Blue e+ the latest version of highly energy efficient cooling unit. Beeta Conveyor panel is crucial conveyor control enclosure, we decided to test our solution on this. Under this concept, we recorded the energy consumption of our Blue e+ model against a local manufactured model using the energy meter. A months unit performance testing showed staggering results. World’s First Revolutionary Cooling Unit “Blue e+”, was leading in terms of energy efficiency and better performance. The test results sustained Rittal Blue e+ as better in terms of performance, energy consumed and cost. Backed by the test results, our suggestions were promptly implemented by Pepsico. This helped Rittal in cementing a long-lasting partnership with Pepsico. Rittal is World's Leading Systems provider for enclosures, power distribution, climate control, IT infrastructure and software & services. Known in high regard for our product and services, our versatile and flexible range of services perfectly compliment the exhaustive product portfolio that we put up. Our team of service partners and trained service engineers help us to provide innovative maintenance services in Rapid Response time. Ensuring impressive and dependable systems in full availability with all application areas worldwide, 24/7, 365 days a year.